at my curent job of about 9 months, we’re near a mcdonalds so i’ve eaten there a couple times for lunch. it’s not as appealing as it was when i was 18 and working at aimnet with minh long. i think we had mcdonalds at least 5 times a week. i remember i’d usually try and wolf the fries down in the car on the way back to work because they only have about a 6-minute shelf life before they get cold and nasty. when i would vacuum out my car every few weeks, i would inevitably find some remnants of mcdonald’s fries and they would look at least half-eatable. if i were to sneak one of these week-old, under-chair fries into someone’s fresh batch at a mcdonalds when they weren’t looking, they wouldn’t be able to pick this one out. i think all my three readers know what i’m talking about. 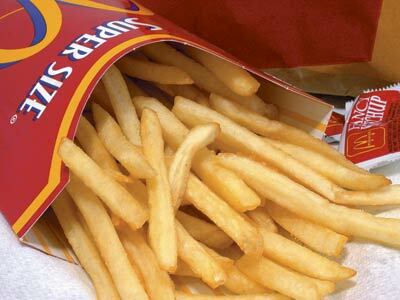 I still think McDonald’s has the best fries. Have you had JIB fries? Disgusting! And they still have skin! thanks for asking me to go to mcdonalds with you.